With this setting, you can activate the automatic execution of the task. This option is not available for timer actions. By entering the start and end date, you can define a period that the automatic execution should take place in. This option is not available for timer actions. By selecting the time zone, you can define which time zone is referred to as the start and end date in this dialog. 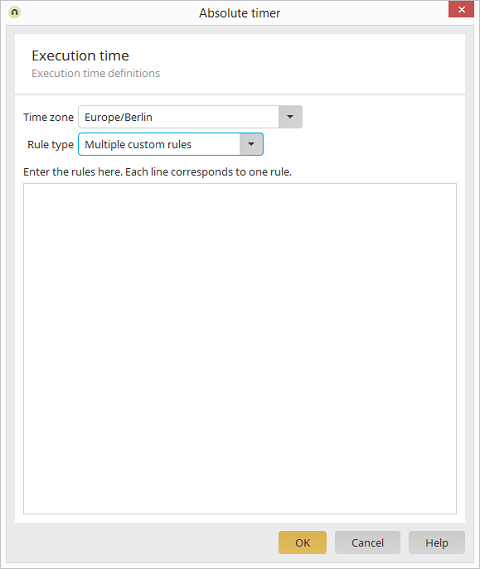 With this setting, the time and frequency of the execution time can be entered. 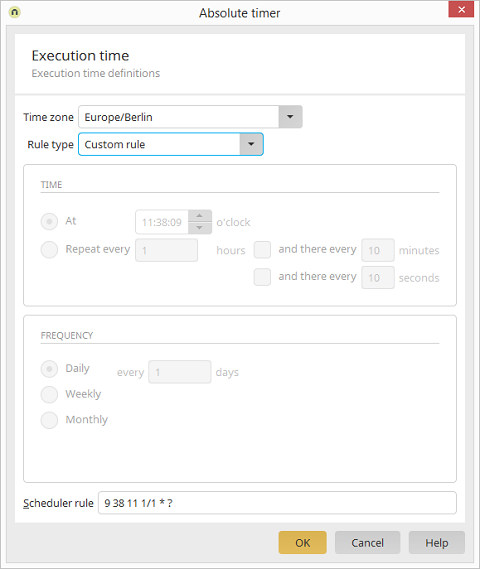 When using this, the scheduler rule in the lower part of the dialog will be updated automatically. 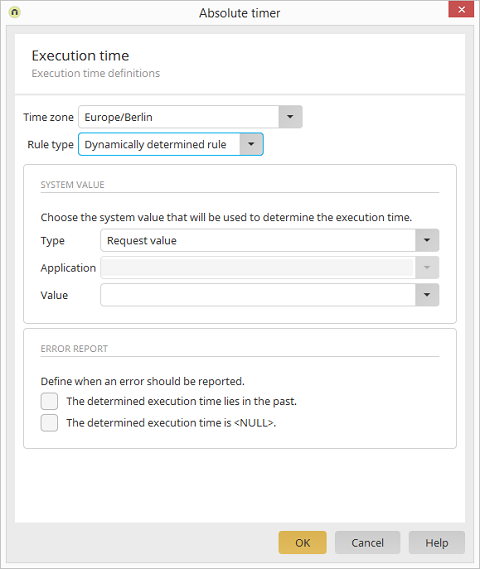 If the Standard rule type is selected, the time of the execution can be defined here. A specific time, which the execution should take place at, can be defined with this option. Here, define after how many hours, minutes and seconds the execution should be repeated. The first time, the execution will be repeated at the next full hour from the value entered in the "From" field. If this is not desired, a custom rules can be defined. The number entered here determines after how many days the execution is repeated. The number entered here determines after how many weeks the execution is repeated. A weekday must be specified here as well. If a weekday is not specified, the job will not be executed. The number entered here determines after how many months the execution is repeated. The day of the month, on which the execution should be repeated, must also be specified. This specification can be made as a number (first, second, third day of the month etc.) or as a weekday (first Monday of the month, second Saturday etc.). If this is not specified, the job will not be executed. The settings which you have defined will be automatically formulated and entered as the scheduler rule here. 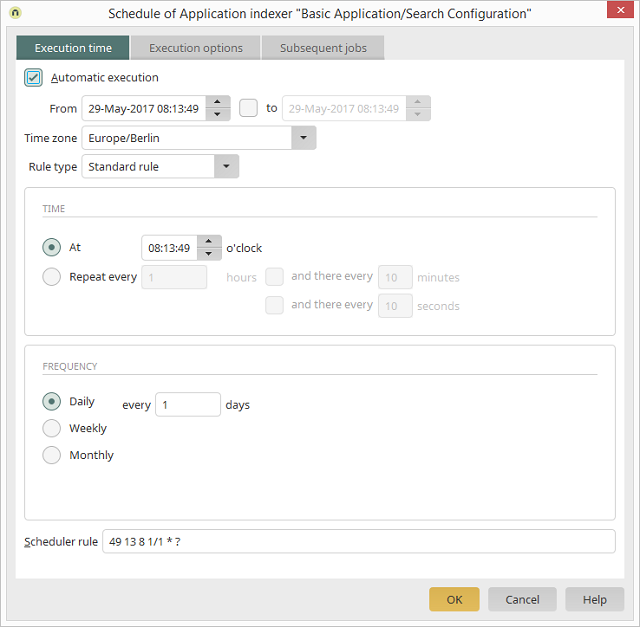 The scheduler rule can be entered manually here. Information about the construction of these rules can be found here. The detailed description of CronTrigger expressions can be found here (CronTrigger class). More complex rules can be entered in a text area here. Information about the construction of these rules can be found here. The detailed description of CronTrigger expressions can be found here (CronTrigger class). This setting is available for timer actions, but not in the Task scheduler. Using a dynamically determined rule, system values can be used to determine the execution time in a process. If you select the System data group option above, you can select the application that contains the system data group here. Here, you can determine when an error should be written in the log file. Activate this setting for an error message when the date is in the past. Activate this setting for an error message when NULL is the returned value.